Click here for their Hours of Operation! 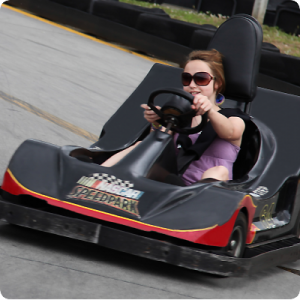 NASCAR SpeedParks are the home of full-throttle fun for everyone! Discover a world of racing tracks for all ages, interactive games, mini-thrill rides for kids, an action-packed arcade, mini-golf, tasty treats, and a broad selection of merchandise representing NASCAR and your favorite drivers! Come for an hour or spend the day. Bring your friends and families, have a party...Experience it all! Other Specials & Coupons To view NASCAR Speedpark Admission Tickets, other Specials and Coupons, go to their special page by clicking here. NASCAR Speedpark updates this page throughout the year, so check back to see if new specials and coupons have come in. Note to our visitors NASCAR Speedpark coupons and specials can change without notice. So please visit their official website to make sure of the latest pricing and coupons.